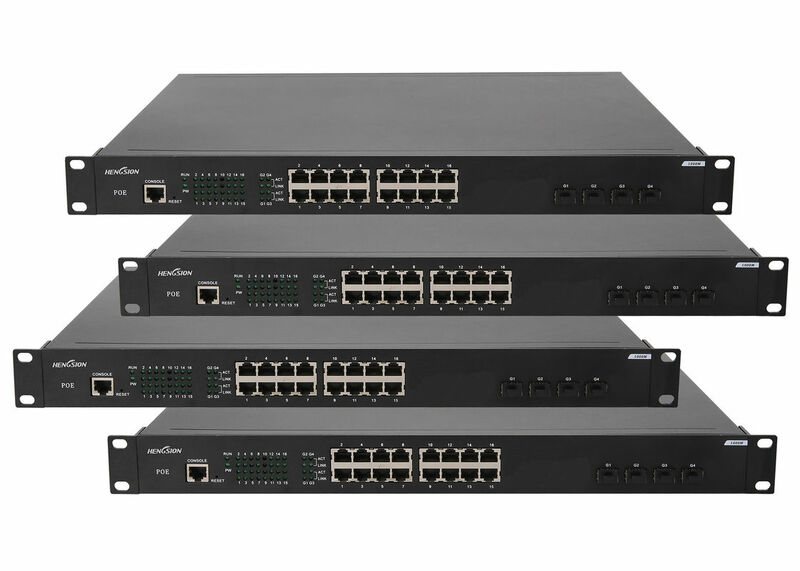 HENGSION managed MNB24G-16EP-4G Ethernet switch provides 4*1000Base Combo ports, and 16*1000BaseT(X) POE Ethernet ports. ▼ 16*1000Base T(X) POE Ethernet ports & 4 Gigabit Combo port. ▼ POE Ethernet ports fully compliant with IEEE802.3af standard provide up to 15.4 Watts per port. ▼ Wire speed forwarding capability of all ports make sure of non-blocking message forwarding. ▼ Support 802.1x authentication, VLAN, and broadcast storm suppression. ▼ Loop detection and Port+ IP+MAC binding. ▼ Support WEB visual interface, support SNMP management. ▼ Overload protection and power reverse polarity protection. ▼ Full-loaded operating temperature range -20 to 70℃. ▼ No fan, low power consumption design.